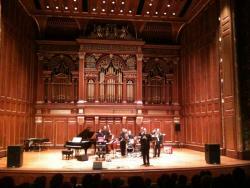 The New England Conservatory of Music, where George and I taught, gave a memorial concert on Friday, October 2, 2009. It took me a while for me to write about it because it brought me so much memories. I was lucky to teach at NEC because of George. Right after I came to study at NEC, I was fascinated with George's music, and became his TA. When I finished my Masters Degree in 1990, George went to his sabbatical, and NEC hired me to teach his ensemble classes and his jazz orchestra. This comes with much more stories but I will save them to later. The highlight of the memorial concert for me was to be able to perform George's small group music again. Sometime in late 90's, George didn't want to do anything with his small ensemble music anymore. He even didn't want anyone to play them. Being his librarian, I have all of his music, and not being able to play them is quite painful. There was an exception, an interesting one. When I was struggling with few gigs, he offered me to have my A-NO-NE Band play his small group music. He was just trying to help me but I can't imagine what would had happened if I took the offer. I am pretty sure it would had not worked out at all. There are many reasons, but I have to save that to later again. Anyway, we played Stratusphunk, Ballad of Hix Blewitt, and Ezzthetic. It was honored to have Joe Hunt, the drummer for the original recording of Ezzthetic. Stratusphunk was written after Miles. Late 50's, George was walking down a Manhattan street. George bumped into Miles. Miles scatted the melody of what became Stratusphunk into George's ear when he was passing by, and kept walking away without saying hello. Being a classical student before I came to the US, I didn't know Miles at all. In 1981, when I was living in a tiny apartment in Tokyo, my landlord who happened to be an editor for a Japanese jazz magazine gave me a front row ticket to the infamous Miles' comeback concert, and I didn't go because I didn't know better. Stoopid. Argh! Stratusphunk introduced me to Miles. I was lucky to see Miles' live shows 3 times before he left us. When I saw him on stage, it was clear to me. He was not a human like us. Later I quit being Christian and started to believe in Miles instead. As Christian would follow Jesus' steps, I wanted to follow Miles' steps. I still pray at Miles' poster every morning to this day. When we play Ballad of Hix Blewitt, we always remember George's relationship with Bill Evans. In fact, George had many compositions tied to Bill which we often performed with his Living Time Orchestra. Even though Ballad of Hix Blewitt was originally written for small group, later George included it in his American Trilogy. What is special about this piece to me is that it is a flute feature, which is very rare since George never liked high pitched instrument such as flute and soprano sax. The story how George met Bill is really nice. I don't remember the detail but this is how it went: Young Bill was visiting NYC as the fist time. George was asked to show him around by someone I don't remember. George wasn't a tour guide type, and he didn't know what to do, but took Bill to Staten Island to show the Statue of Liberty as most everyone would do. George took Bill back to his apartment right away, and have Bill sit in front of George's piano. As soon as George heard Bill playing, George said: "Would you like to play for my upcoming recording?" - that was 1957 "Jazz Workshop".